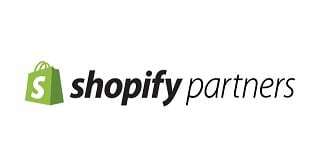 Which company profile below piques your interest more? Sometimes being short is not always sweet. Besides its length, Example 1 also lacks details. It is vague, using terms like “provide solutions,” “several high-profile projects,” and doesn’t attempt to build any rapport. On the other hand, Example 2 is specific. Its description sends a “value-driven” message, with examples and results that you, as their audience, can relate to. To top it off, it shows a more personable approach compared to Example 1. Brand personality is critical in digital marketing. In an increasingly information-saturated world, it helps your brand stand out. Your company profile – from your “About Us” page to your social network profiles – shares your personality with an audience, and it’s imperative that it resonates. What makes a company profile boring? In Example 1, any audience considering the company’s services may find it ineffective because it does not provide any detail that makes it appealing. Less ambiguous statements that are backed by data and are specific can improve it tremendously. In fact, Example 1 committed almost every company profile-writing sin on this list because it was too brief. In a way, it doesn’t consider any interest of its audience, which just makes it plain boring. Your website is your virtual office in cyberspace, and your social media profiles are your online “outlets” representing your brand on their respective networks. Anything you say in these profiles reflects the image and values of your company. A company profile should reinforce and proliferate your brand’s authority in your respective niche or industry through a well-developed story. It is therefore important to invest some time in creating a good one. Here’s how you can bank on your strengths without going overboard. Everyone knows this: black and white are boring when compared to the spectrum of colors on the color wheel. The same way a colorful website drives attention to elements you wish your audience to focus on, a ‘colorful’ company profile can really make your brand stand out and be noticed. It is first important to develop the right tone of voice that resonates with your defined customer persona. More importantly, the tone of voice is something you must be comfortable with personifying to the world. The table below shares voice characteristics you may consider for yourself. The right ‘color’ for your company profile can have an amazing inbound effect as it proliferates. A company profile should not be too short, à la Example 1 above. At the same time, being overly verbose can be detrimental too. “Hello there, we’re Company C! On the surface, it seems like it has all the ingredients that might sell your company right. However, it is too lengthy and has lots of unnecessary details that borderlines on narcissistic. Your audiences want to know what you did, how you did it, and how it ended up with just enough details that are easily digestible in a few seconds. In comparison, Example 2 is about the right length. Each sentence is focused on improving the understanding of the reader about their business. Specifics are kept to a minimum, enough to impress readers, but shies away from overloading them with percentages as listed above in Example 3. The language utilized also needs to be simple enough that even an 11-year-old can understand it. It is important to ensure audiences outside your industry can easily understand your profile. This helps it to proliferate faster. People bond over stories. While discussing your company’s results with clients, your profile also needs to mesh its personality with a mission and purpose. Get readers to “be in your corner” when they read it. Humanize your profile to help your audience connect. If pitching your profile online, via social media, for example, utilize the area provided for writing your “About Us” section. Try including the origin story of your brand and the values that make your company what it is. 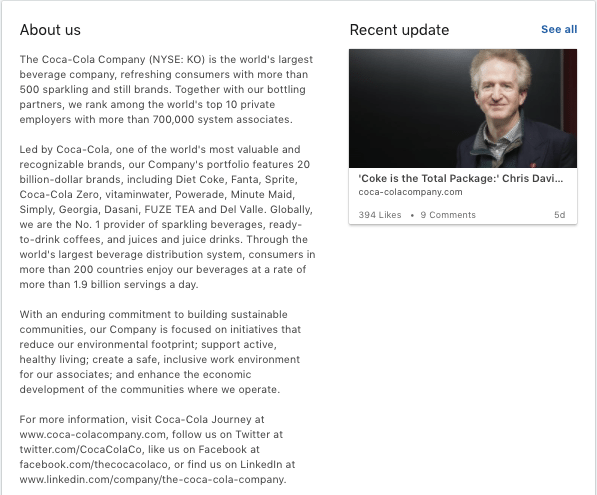 See Coca Cola’s LinkedIn profile, a network that allows more space to write a lengthier profile. On other social networks, try condensing it while maintaining the story. Read the “Do’s and Don’ts of Writing Your Company Story” for more details. The Friendly Neighborhood Business: Small and medium businesses targeting their local communities benefit greatly from this type of narrative. The narrative focuses on the brand’s values when it comes to creating their products or providing their services. 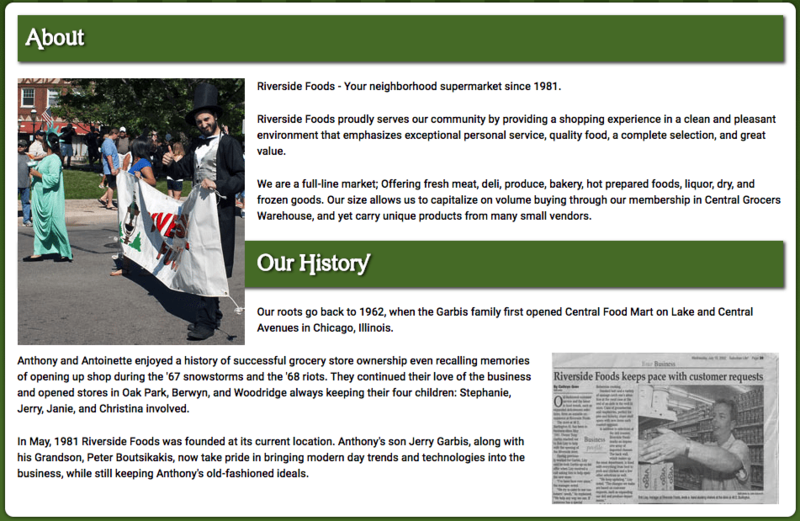 For example, Riverside Foods’ narrative focuses on the founding family’s first food mart and their experience forging the standards they have in providing their quality products and services. The Professional and Clean-Cut Solution: Medium to larger businesses targeting other businesses use this particular narrative in their descriptions. It focuses on their processes and continuous development of practices to optimize their operations. An example is Addiction Foods. It is a custom pet food manufacturer for dog food brands, writes in their ‘About’ page that they focus on reinventing and revolutionizing pet food formulation and production consistently for their clients. 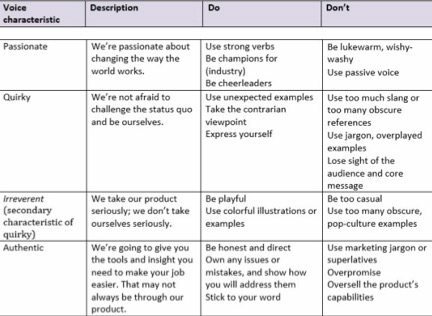 The Doer: All businesses of different scales can find this particular narrative style efficient in developing brand retention despite its objective and achievement-driven voice. Henrik Plumbing from California uses a third-person narrative approach in their description. It details their specialization in residential, commercial, and industrial piping services. Further stress is placed on their efficient operations due to their 25 years of experience providing their services. Before publishing your company description, have someone else read your profile. This isn’t just to spot editorial mistakes. You can easily develop tunnel vision when writing descriptions. Another set of eyes helps to reveal areas to make it appeal even more. The more people you share your profile with, the better. It’ll allow you, over time, to collate feedback and craft an even better company profile that has a greater impact on your business. Company profiles tell people what your company can do, how it began, and what it can, and has, achieved. It’s something worth investing time in and crafting with care. Best of all, it’s easy to do! We hope these five simple steps can ensure that your profile stands out from the rest and creates the right traction for your brand. Monica is a Digital Specialist in 2Stallions Digital Agency. She studied communications and has worked with multinational brands such as Honeywell, 3M, and Kimberly Clark. Monica has also worked as a Managing Editor for several travel magazines where she realized her love for writing. She also occasionally dabbles in the kitchen but wouldn’t turn down an offer to eat out or binge-watch on Netflix. We started a newly established company in frozen,chilled and dry foods. I would be appriciate, if you could help to make our profile.